§ 37. He was accustomed to relate these things more frequently to the brotherhood, lest they should wonder at his conversation as being peculiarly exalted, because, despising secular cares, he preferred to live apart. 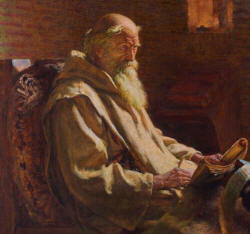 “But,” said he, “the life of monks may well be wondered at, who are subjected in all things to the orders of the abbot, the times of watching, praying, fasting, and working, being all regulated according to his will; many of whom have I known far exceed my littleness, both in purity of mind and advancement in prophetic grace. Among whom must I mention, with all honour, the venerable Boisil, servant of Christ, who, when an old man, formerly supported me in my youth at Melrose Abbey, and while instructing me, he foretold, with prophetic truth, all things which would happen to me. And of all things which he foretold to me, one alone remains which I hope may never be accomplished.” Cuthbert told us this was a prophecy of Boisil, that this, our holy servant of Christ, should attain to the office of a bishop; though he, in his eagerness after the heavenly life, felt horrified at the announcement.